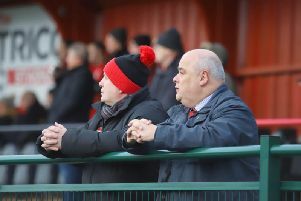 The Poppies will be crowned Evo-Stik League South Premier Division Central champions if they beat play-off contenders Alvechurch this weekend. 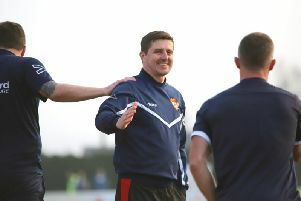 The first opportunity to clinch the title arose after experienced striker O’Connor fired home a dramatic winning goal in the fourth minute of stoppage-time to give the Poppies a 1-0 success at Leiston last Saturday while second-placed Stourbridge could only draw 1-1 at home with St Ives Town. That gave Marcus Law’s team a 13-point advantage at the top with just five games remaining to make it a case of ‘when’ and not ‘if’ the title will be secured. But they will now have the chance to do it in front of what should be a bumper attendance at Latimer Park this weekend. And while O’Connor knows there will be plenty of hype ahead of kick-off, he insists it will be business as usual for the players once the game starts. “We spoke about it after the game at Leiston and we are hoping the fans turn out in numbers,” the frontman said. “If we can get the right result then we can make it a day to remember. “From our point of view, we have to treat it as another game of football. “Once you are out there, you forget about everything else and just concentrate on the game. “I am sure there will be a lot of build-up for the game and it would be strange if there weren’t a few nerves. “But once the game starts we have just got to try to do what we have done for most of this season. “We can’t let the occasion get to us. If we turn up and show the same resilience and character we have shown over the last eight months or so then I am confident we can get the result and give the fans a big day."